Samsung Galaxy A5 (2017) review | What Hi-Fi? It’s a sign of the times when a smartphone at £350 is considered 'mid-range' and ‘affordable’. But the Samsung Galaxy A5 does enough to make us question why we’re often persuaded to spend double that on a flagship model. This A5 does everything just fine, thank you very much. Of course, ‘just fine’ isn’t going to cut it with everyone, but if you’re looking for a phone that balances price and performance, the A5 could well be worth a look. One of the great things about the A5 is it doesn’t look like a mid-range phone. It doesn’t feel like one either. In fact, at first glance you could be forgiven for mistaking it for last year’s Galaxy S7. It’s covered front and back in smooth Gorilla Glass, with cool aluminium trim around the outside and a subtle curve to its back edges. This all ensures a really premium feel while also helping it to sit snugly in the hand. Its dimensions make it easy to use one-handed too, with the 5.2in screen stretching to within a millimetre of the phone’s left and right edges. It’s not the bezel-less design of the Galaxy S8 but there’s very little wasted space. Along the bottom, there’s a physical button that doubles as a fingerprint scanner, flanked by two touch keys for multitasking and back-stepping. The volume buttons on the left-hand edge and the power button along the right sit in perfect positions for easy access, while the SIM and microSD (up to 256GB) card trays are split between the top and left-hand side. There’s very little that would give away this phone’s mid-range status from its design, except when you realise Samsung has used Gorilla Glass 4 instead of the more recent 5. The latter – used in several of this year’s flagships – has been drop-tested from shoulder height, while the former has only been tested from the waist. It’s not something you’ll notice in daily use, or perhaps even care about, but it’s small things like this that help Samsung keep the phone’s overall price lower. The Galaxy A5 is available in black (Black Sky), gold (Gold Sand), pastel blue (Blue Mist) and pastel pink (Peach Cloud). The colour you choose covers the whole of the phone, front and back, with the aluminium trim closely matched to complement it. The Galaxy A5’s 5.2in screen uses the same Super AMOLED technology we’re used to seeing on Samsung handsets, but the resolution drops to 1080p Full HD from the 2K displays of the flagship phones. Whether because of this reduction in resolution or less-capable processing, the step down is noticeable to anyone used to a pricier handset. Text on webpages isn’t quite as crisp as you’ll see on a more capable handset, and outlines in video can look a touch on the soft side. In fact, there’s a whole layer of fine detail this screen isn’t too adept at portraying, leaving images looking a little less crisp than those on a flagship display. This phone comes in at half the price of a Galaxy S8, though, so compromises are to be expected. Taken on its own merit, the video performance is bright, punchy and relatively stable. We do notice a bit of banding in bright scenes that shows up its less accomplished processing, but it’s not a deal-breaker. Samsung seems to have found a better colour balance this year too. The default Adaptive Display we’ve been turned off by before seems to be better considered here, though we still prefer the AMOLED Cinema setting for vibrant colours with more depth and believability. It does leave whites wanting a bit (you’ll get brighter whites – and white balance control – by choosing Adaptive Display), but we’ll take that in exchange for a more realistic colour palette. As usual, blacks are top-notch, though we have seen better shadow detail further up Samsung’s range. The A5 packs an audio performance that sounds a lot like Samsung’s flagships did a few years ago. And that’s not necessarily a great thing. While the amount of detail is probably about right for what can be expected at this level, it’s definitely lacking the insight of a more capable handset and its timing sounds just slightly off too. We need things to be a bit tighter and crisper to really get our toes tapping. The sound is well balanced though, with a decent amount of bass weight available when it’s needed. Vocals are clear and cohesive too, and the treble is kept well under control, steering clear of sounding thin or bright. It’ll play hi-res files loaded onto the phone but apparently downsamples them, as the ‘hi-fi’ badge we’d usually see on 24-bit files is nowhere to be found. You can hear the difference. While our 24-bit/192kHz version of Muse’s Supremacy usually sounds airy, detailed and dynamic, here it sounds a little flat and cumbersome. It's lacking the usual punch during the exciting guitar instrumental. It’s an average performance then, one that falls rather short of Samsung’s more current crop of flagship handsets. The Galaxy A5 offers up two pretty impressive-looking snappers on paper, having 16MP f/1.9 cameras both front and back. The reality is these are mid-range snappers, and they don’t come close to challenging the 12MP camera from the Galaxy S7, for example. Once again though, the performance feels respectable for the A5’s level, producing well-considered shots in good light and giving low-light shots a good go too. In daylight the shots produced are crisp and bright, with realistic colour reproduction. The autofocus is quick, so you can fire off shot after shot, and the whole camera interface has been simplified so there’s less fuss. It does lose some of the manual options you’ll find on flagship phones, but you’ll still find the Pro mode which offers ISO, white balance and exposure controls. We stick to the Auto setting, and find detail levels pretty good. You’ll lose some insight in the lightest and darkest areas of your snap unless you manually select HDR mode - there’s no auto HDR here. Selfies in good light look pretty good too. They’re a little smoother (even with Beauty mode turned off) due to the lack of autofocus on the front lens, but the large aperture does help give them a really nice depth of field. Switching to low light is where you’ll notice the sensors start to trip up though, particularly because of the lack of optical image stabilisation. The f/1.9 sensor does manage to lighten up a dingy scene, but pictures lack the detail of well-lit shots and look a little smudgy, most notably around the edges of the shot. The flash does a good job at lighting things up if you need it, though it’s a touch on the strong side and can blow out brighter or close-up areas. There’s little to knock the A5 for when it comes to overall performance. It’s smooth and responsive in use, and though you might notice it to be just a fraction slower than a flagship device, used in isolation it’s not noticeable. 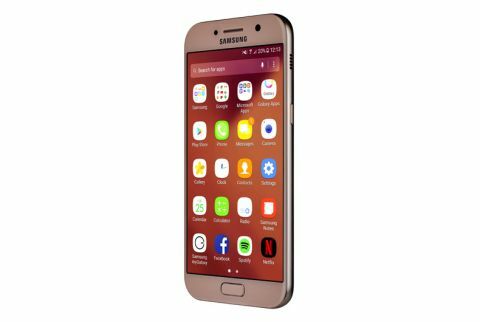 Running the show on the A5 is Samsung’s own octa-core Exynos 7880 with 3GB RAM – a mid-range chipset with slightly slower DDR3 RAM (compared with DDR4 that you’ll find in flagships). It’s supported by a decent GPU, which is capable of running graphics-heavy games such as Asphalt 8 at full resolution with no stutters. It’s not the sharpest, most realistic rendering we’ve seen of the game, but it performs well and doesn’t get too hot in use either. Samsung’s Game Launcher overlay hovers at the edge of the screen, and a click of its icon allows you to turn off alerts while playing, lock the touch keys and record or screengrab your gameplay. There’s 32GB of on-board storage, expandable by up to 256GB via microSD, which should be plenty for even the heaviest of media hoarders. Samsung’s TouchWiz interface sits over Android 6.0.1 Marshmallow out of the box It's a slightly dated version of Android but one that is expected to be updated to Nougat soon. While it’s not the prettiest of manufacturer UIs, it is much less bloated than it used to be and comes with far fewer pre-installed apps hogging your storage. The 3000mAh battery does a pretty good job of pushing for an all-day battery life, and we find in testing that it will easily see us through a day of medium-to-heavy use. On half brightness, streaming from Netflix over wi-fi sees the A5 drop only 5 per cent battery in an hour, which is respectable indeed. It comes with fast charging via its USB-C port too, meaning you can reach around 80 per cent from empty in an hour. It’s also waterproof to IP68 (submerged to 1.5m for up to 30 minutes), which is a great addition at this level. The Samsung Galaxy A5 is a mid-range phone in flagship clothing, and does a pretty impressive job of balancing the two so you don’t feel like you’re missing out. Understandably, there are some compromises to be made, but Samsung has picked them carefully and, in some cases, you might not even notice you are making them. One sticking point for us is this phone’s poor attention to audio. That, and the fact it has some pretty stiff competition, such as the similarly priced and better-specified OnePlus 3T. Even last year’s now lower-priced flagships show the A5’s £350 price tag to be a little on the steep side. The Samsung’s performance, feature set and build quality still make it worthy of consideration though, and the A5 gives the flagship phones of 2017 plenty of reason to stay on their toes.